BLUG, the annual Belgium/Luxembourg user group held in Antwerp was a great success and although Antwerp literally is only 45 minutes from where I live this was only my first BLUG. It has left a big impression! We are more then a week on but I’m still going over it in my head. It was a great event. The organization was excellent, the venue catered exactly to the needs of the event, the sessions, the speakers, the food, the socializing, the people, …. I could go on and on. Simplest to say: it just came together. Theo & staff did an amazing job and deserve all the credits (and MORE) everyone has been sending them! 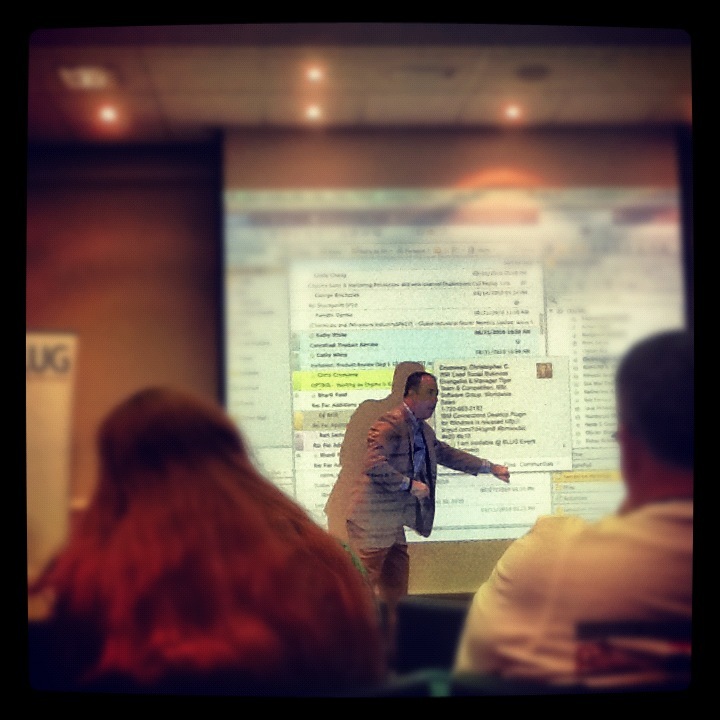 BLUG to me was about learning, meeting people and discussing ideas. Being able to talk to and exchange ideas with so many that are right there in the trenches, implementing Social Business, learning as they go and muddling through all the caveats and problems that they, as true pioneers, encounter on their way. Because lets face it. Although we all talk about it it is still a relatively small contingent of modern businesses that are actually doing it. That is the funny aspect with things like this. If you focus so much on it you start to lose sight on the larger picture and to be frankly, the larger picture is that a lot of our customers really haven’t seriously thought about implementing Social Business yet. So we try to show them the benefits, take them by the hand and help them grasp this great new concept of….what? “Social?! ?“Well what is social, and more important why should I?!? It was all just one big roller coaster of impressions and ideas. And the one thing I found was that although the basic principles are more or less the same to everyone: Respect for the role of the individual within the business Eco-system and empowerment of the employee to participate and connect – the way people envision how it should be implemented still differs greatly. Do you control, or not? Do you steer or do you let it evolve in itself? Do you need to change your corporate culture first or do you let the social process change your corporate culture? It all just depends on the people, the business and the situation. There is no ‘one size fits all’ when it comes to Social Business and although I already knew this, BLUG has certainly reinforced that to me. I learned so much from so many these two days. Information I will be taking along to customers, in projects and to my own corporate social environment. So yes, my head is still spinning from two days of BLUG. It is sparking new thoughts, it is exciting and it is daunting. I still know so little and can learn so much. Thank god for events like BLUG, Social Connections, NLLUG, AUSLUG and many others like it for offering this to all those that want to improve their knowledge! Because let’s face it isn’t that what ‘social’ is all about? Connecting, sharing and collaborating! The Social Business revolution is here. We are living in a new world and one of the ‘old’ relics being under attack is email. Email a relic?? Yes in the eyes of some, it is outdated and in need of retirement. Nowadays it’s all about new forms of communication. more direct, more interactive, less static…and all kinds of initiatives like ‘Global No Email Day‘ and IBM’s ‘OutsideTheInbox‘ are started to get people to realize this. I can totally relate to this idea. Mainly because it seems that lately it isn’t us that is consuming mail but the mail that is consuming us. More importantly: consuming our time. Ok, so I agree, but then I started thinking. How many mails do I actually get in a day…..? I’ve got 5 email addresses. One for work, one for friends, one for non-work-non-friend related stuff I deem important and 2 for spam. I use those last two when I need to register on some obscure site and I never check those two unless I’m looking for something specific. So those don’t really count towards my email consumption. The other three gave me a total of 12 messages today, 7 of which were notifications from other systems. Now that isn’t extreme! That is actually pretty low if you consider I work in IT and was working at home today. I know people that get hundreds of messages, especially while working at home. So why don’t I? Does this mean I don’t work, don’t communicate…..?? No, I actually communicated with several of my colleagues and customers today as well as had interactions with several people around the globe. So lets analyze this…. I started the day with an email notification from Quickr about a document I’d put up for review. It was reviewed by a customer in the USA and she’d updated the document in the Quickr environment and used the notification option to let me know. As I noticed the customers project leader was online on Greenhouse Sametime I used this to have a short discussion about the review. I then proceeded with opening our new IBM Connections test environment that we set up specifically for demonstrations to customers. To get some filling all employees were asked to fill out their own fictional profile as well as provide some fake content. While doing this I noticed some problems with the test installation. Instead of using mail I put a message on the Administrators notice board, telling him about the problem. 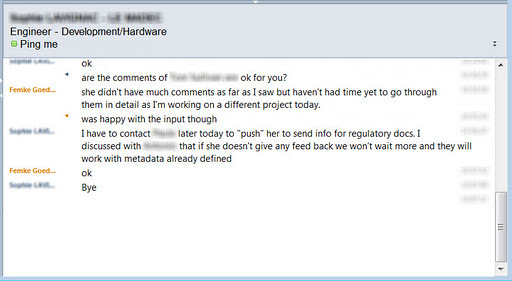 He responded back on the board which was promptly shown in my Status Update widget in my Lotus Notes client. Now I could just as easily have used our internal Tweet application as well but as it was Connection related it seemed logical to respond within the environment itself. Using mail didn’t cross my mind once. Roughly at the same time I was invited into a Skype call by another customer. During this call I had to verify something with a co-worker and with a Partner of us. So I used LotusLive Sametime to connect to my co-worker and set up a second Skype chat to ask my partner contact. He wasn’t up yet (Canadian) so I just left him a message in his chat to pick up when he returned. While all this was going on I was also setting up a test environment for a migration project. It was not exactly going as planned and I used Twitter and Facebook to vent some of the frustrations with getting the thing to work. Apart from the fact this helped me to vent some of my frustration it also delivered a handy tip from a guy that responded to my tweet and sent me a helpful link. Through the social media app I use I also noticed a new invitation request on LinkedIn that turned out to be a business relation that wanted to connect. As I’d been wanting to talk to this person for a while I used the opportunity to send him a direct message in LinkedIn and set up a phone call. For the rest of the day I made several phone calls to customers & relations, used text messaging to make an appointment with a good friend, had a lengthy call with a co-worker on the server I was trying to set up and congratulated my niece with her birthday on Facebook. So looking back on my day and talking about the ‘Less mail’ initiatives, I can honestly say I’m actually doing pretty well already. I’m not email-free yet (nor do I want to be, there’s always something that is better done through mail) but in general I can definitely say I’m not being consumed by my inbox. There is however another side to this. Remember that Skype chat I started with the Canadian guy that wasn’t online yet? He did get back to me but by that time it was evening here. And that is the whole crux in this story…. Because one of the downsides of using more interactive forms of communications like Social Media, Skype and Sametime is that it is stretching my day. Timezone differences mean I have to adept to other peoples day regimes if I want to speak, chat, Sametime or Skype with them and that means I tend to spend a lot more time at night behind my laptop, sometimes stretching well into the night. So are these forms of social communications the future? Yes, definitely! It allows you to not just communicate but to really build a relation with the other person, something that email just didn’t do. But I don’t think it will put email out of business yet. If not for the fact that lots of people still are hooked on mail then for the sanity of those that need to sleep….